Updates : May 2018 The location from where the mesmerizing view of Sewri flamingos was seen has been restricted to public. Yes, for at least next 7 years no one will be able to reach mudflat seashore area as MMRDA has begun working on India’s longest Sea Bridge much in news called ‘MTHL’ (Mumbai Trans Harbour Link) that will connect Mumbai to Navi Mumbai’s Jawaharlal Nehru Port. 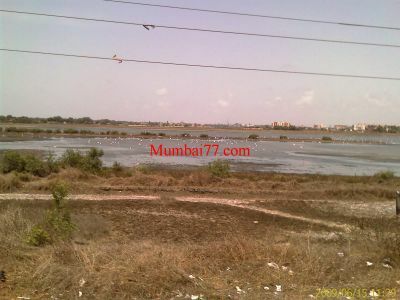 Sewri mudflat is one of the highest visited with maximum flamingo’s flocking in between November and May. Same location is where BNHS conducts yearly festival every February. MMRDA has promised to open gates to public once the work gets completed, But that too will take about 7 years. Till then, Flamingos has also taken a back foot of about 100 metres away from its regular locations to keep away from the disturbance of construction. We hope, mudflat of Sewri rolls back in much beautiful way once the work of 22 Km long sea link gets completed. Mumbai’s winter guest, those pink feathered flamingos are one of the main bird watching attractions between citizens, hobby and professional photographers. They were first been spotted in late 1980’s. This is the special place at Sewri (Also pronounced as ‘Shivdi’) which is 10 square kilometre mudflat location not far from railway station. 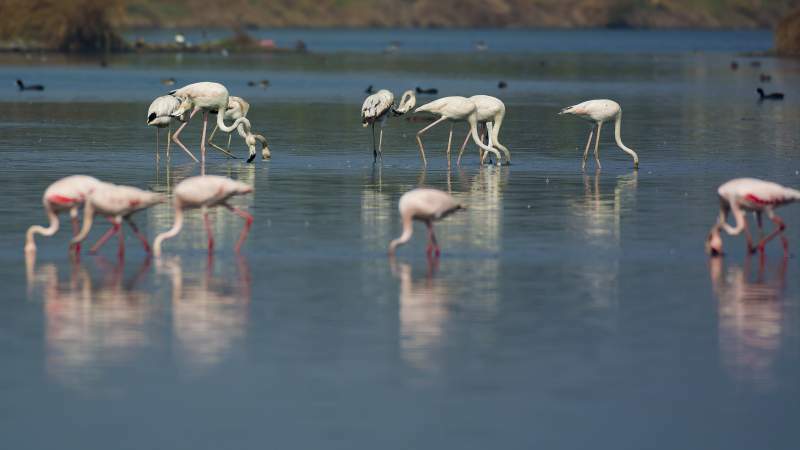 An ideal location for migratory birds, every year specially attracting this long legged pink spotted flamingos migrating from Gujarat’s Kutch and other locations in groups of thousands. At a time about 7000 to 10000 flamingo can be seen in group at mudflat post November making sewri mudflat an awesome scenic location specially during sunrise and sunset. Flaying to Mumbai far from hundreds of Kilometres they are here to clean and eat out human and industry waste at those black dirty mudflats. They are unknowingly helping humans in a great way. Their are many other species of migratory birds that can be spotted here in Sewri like Terns, Purple Heron, Green shanks, Kingfishers, Egrets, Sandpipers, Some varieties of sparrows and Pariah kites. Every year BNHS (Bombay Natural History Society) keeps a day called ‘Flamingo Festival’ dedicated to this special bird. Usually the schedule and perfect time for flamingo watching is between March and April as declared on their website. One of the contact numbers hope not outdated is +91-22-22821811 to inquire about the same if you want to join the watchers group. The basic motive and theme of this Flamingo festival is to educate citizens about importance of these birds to our life, how this wetlands (mudflats), mangroves forest are part of our life and are constantly working as life savers and why encroachment and dumping debris at such sensitive coastal area is dangerous to human as well as these bird species. Bird watching brings citizens of Mumbai near to nature to understand importance of Eco-system and how to stay balanced in Eco-friendly way. Various articles in leading newspapers also tries their best to educate the importance of such wet zones and how the industrial waste, oil splits and sewerage is dangering our human life and not just those beautiful birds. Bird watching destinations like the newly opened Thane Creek Flamingo Sanctuary are now protected by forest department from some cruel activities like flamingo hunting and are already been taken care of. You might also be interesting in knowing about Annual bird race in Mumbai, An events organized annually for those bird watchers and lovers. 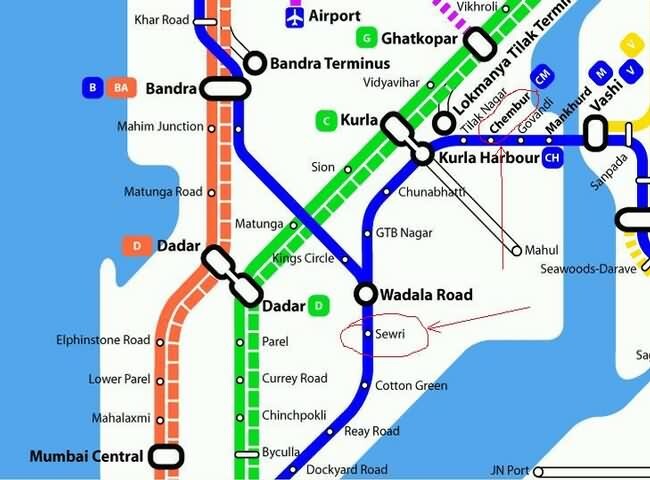 How to reach Sweri Mudflat : Sewri is one of the railway stations in Mumbai located on Harbour Railway Route (See Station Names). Bandra is the ideal railway station for those travelling from Western Railway Route. Another famous creek for flamingo watching is at Chembur, a station on Harbour Railway Route. The exact location where these pink birds are spotted is at ‘Mahul creek’ inside Mahul Village, near/connected to Chembur. Take guidance from map and help from villagers on how to reach Mahul creek. Once their you can see a small muddy road reaching the creek which has boats of fisherman at coastal, Fishing nets and lots of Mangroves. After Sewri, this is another peaceful location that attracts this migratory species in groups. Feel free to take photographs, enjoy the view and great if carrying a binocular. How to Reach Mahul Creek : Reach Chembur via Road or Local Trains and head to Mahul Village. Little help may be required from Local villagers or best is the navigation app. Opened to public on 1st May 2017, This is a secured location and a preferred location to get along with family and friends as Thake Creek that Connects to Sewri and Airoli has been declared as Flamingo Sanctuary which has Coastal and Marine Biodiversity Centre for education and flamingo watching. For More details See Sanctuary article. Exact location being, NRI Complex Phase-II, Seawoods Estates Road, Sector 58, Seawoods, Navi Mumbai, Maharashtra 400706. This is a beautiful location connecting the wide open sea behind and welcomes flamingoes since many years between November and June. Talawe mud flat as it is known is owned by CIDCO and has problems like debri dumping, fishing, alcohol consumption and dumping etc. As owned by CIDCO, they plan to develop another residential complex here with a huge golf course which is highly opposed by local residents, activists and bird lovers. This wetland attracts about 100 to 200 flamingoes between winter and monsoon, But this year 2018 was a no show and in May they arrived in groups of hundreds. People are happy looking at the spectacular view of huge groups of migratory flamingos and rushing to get glance of same. Not many knows about Flamingo spotting at a wet land between Vasai and Naigaon station in West. At far north suburb of Mumbai is this Thane district railway stations with wide open plots along the railway tracks where these Flamingo are seen every year. It is not a huge mudflat, But a ideal location enough to attract few hundreds in group. So if you stay between Bhayandar and Dahanu Road and travel via local trains, Spot few flamingo’s at Naigaon fields along the railway tracks, Just before Naigaon railway station when towards Mumbai.